Worth its weight in gold, a dog exercise fence is one of the best management tools for training and confinement on the market. A dog exercise fence is usually referred to as an ex-pen or exercise pen. What Is a Dog Exercise Fence? Commonly known as an exercise pen or ex-pen, this portable fencing can allow you to create a safe place for your dog in nearly any environment. Made from heavy gauge wire, these portable pens normally consist of eight hinged panels. The hinges make the ex-pen easy to fold up and store away. They are sturdy and come in sizes ranging from 24 inches to 48 inches in height. They are around 16 feet in length. Ex-pens can be used indoors or outdoors during those times when you need to be sure your dog stays in a particular area. The hinges allow you to configure the size and shape of the ex-pen in any way you wish. You may also wish to use the ex-pen as a barrier gate to keep your dog in a particular part of the yard or house. There are a variety of uses for exercise pens. There are also soft sided ex-pens. They are similar to the heavy gauge wire type, but are usually constructed from canvas and mesh. The advantage to this type of exercise pen is that it weighs less, so it is easier to fold and take with you. The drawback is that if a dog is destructive, he can easily chew or dig through the panels. Managing your dog's environment is one of the best ways to encourage and maintain good behavior. An ex-pen can provide a comfortable place for your dog when you are not there to supervise and train him. This is also useful if you are with him, but cannot give him your attention. Traveling with your dog can be fun if you are prepared. Taking an ex-pen along on your trip will ensure that your dog will have a secure place to relax in a variety of situations. Being on a leash all the time can be stressful for a dog and his owner. Unfamiliar surroundings can cause a dog to accidentally behave inappropriately. He may relieve himself on the silk ficus tree in the motel room, or may become bored while you are in the shower at Aunt Tilly's house and decide to romp with her teddy bear collection. At the end of a long day of exploring, a roomy ex-pen with a soft blanket and some interesting chewable items to enjoy can be a welcome respite for your dog. This will also give you some peace of mind and a chance to relax as well. Ex-pens can be a real life saver when you are trying to housetrain a dog. The ex-pen will allow you to either train your puppy to use a box or piddle pad, or will keep him in a limited space until you can take him outside. If you are training him to go outside, try to take him out often enough to prevent accidents from happening in the ex-pen. Ex-Pens are used quite often at dog shows to keep the canine participants safe and happy until it is their turn to run around the ring. Ex-pens are also used to create a barrier that will restrict dogs to a certain part of a house or yard. This is sometimes important to help manage destructive or escape behaviors when the dog is not being supervised. Exercise pens are also useful to keep your dog calm and safe after surgery or during an illness. Using an exercise pen is a good way to manage your dog's environment. In no way is an exercise pen a large enough place to keep a dog the majority of the time; it does allow him to move around, but not enough to constitute exercise in spite of what its name may imply. Feed your dog in his ex-pen. Do not leave him alone in it until he has had time to adjust and feel comfortable. 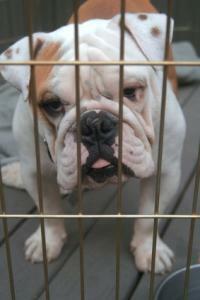 Dogs should not stay in a crate or ex-pen for an eight hour day, and then an eight hour night. Leave water for your dog if he will be unsupervised. Do not leave collars on unsupervised dogs in confinement. Follow other good crate training practices.